For many centuries the Pfinz shaped the townscape Grötzingens. They flowed in an open trench without dam through the middle of the old village, still remember some of the street names in this situation. 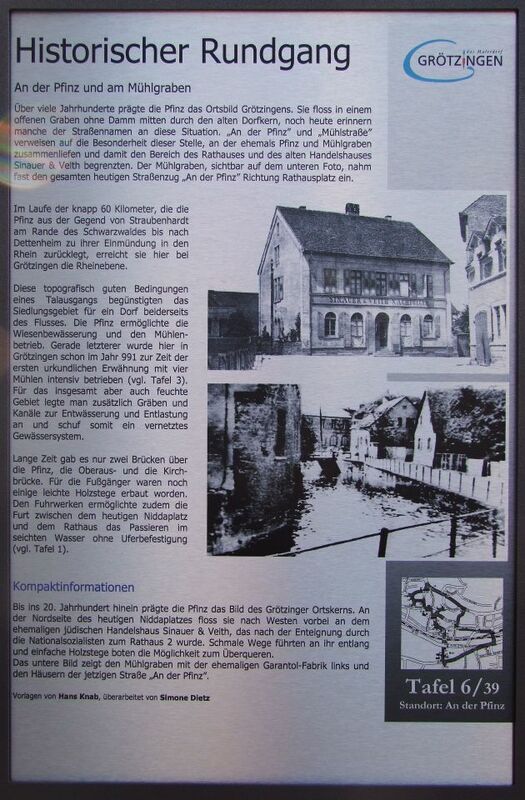 "At the Pfinz" and "Mill Road" refer to the special feature of this place, came together at the former Pfinz and Mühlgraben and thus the area of the town hall and the old trading house Sinauer & Veith limited. The Mühlgraben, visible on the photo below, almost took the entire present-day streets "At the Pfinz" towards the city square one. Over the almost 60 kilometers traveled by the Pfinz from around Straubenhardt on the edge of the Black Forest until after Dettenheim to its confluence with the Rhine, they reached here at Grötzingen the Rhine valley. This topographically good conditions a Talausgangs favored the settlement area for a village on both sides of the river. The Pfinz allowed the meadow irrigation and mill operation. Especially the latter was here in the year 991 at the time of first mention with four mills operated intensively in Grötzingen (cf.. Table 3). For the total but also moist area is additionally put on ditches and canals for drainage and discharge, thus creating a crosslinked water system. For a long time there were only two bridges over the Pfinz, the Oberaus- and Kirchbrücke. Some little wooden bridges were built for pedestrians. The carts also enabled the ford between today Nidda Square and the City Hall passing in shallow water without bank protection (cf.. Table 1).